The Training Area is that portion of Fort Drum north of Rte. 26. Approximately 70,000 acres of the Training Area is open for recreation including hunting. Hunting and other recreational use of Fort Drum is in accordance with New York State Hunting Laws and Fort Drum Regulation 420-3 Hunting, Fishing, & Other Outdoor Recreation (unofficial version updated 9 Aug 2018). Fort Drum is Wildlife Management Unit 6H. Big game hunting seasons on Fort Drum coincide with the Northern Zone seasons in New York State. Hunter education courses are offered by New York State Department of Environmental Conservation (NYSDEC). A hunter education course is required for persons who cannot provide proof that they have ever possessed a hunting license. The general course is a minimum of 10 hours in length and offered free of charge. NYSDEC honors hunter education certificates and sporting licenses from all other states and countries. Note that NYSDEC also requires a hunter education course specific to bowhunting. (NYSDEC does not accept a combined hunter education course for bowhunting certification.) See the NYSDEC Hunter, Bowhunter, and/or Trapper Education web site for more information. Below are links to the different classes offered that can be sorted by distance from a zip code location. Scouting of training areas prior to the hunting season is permitted but hunters must have a Fort Drum Recreational Access Pass in their possession and must follow regular check-in/check-out procedures. All recreationists in Fort Drum training areas during any hunting season (September 1 - March 30 and May 1 - May 31) are required to visibly display a minimum of 144 square inches of blaze orange on the front and back of their upper bodies, and are also required to wear blaze orange headgear. 1. Any activity between 01 June and 31 August. 2. Archery hunters in Archery Hunting Only Areas (including the Cantonment Area). 3. Archery hunters while in a stand at least 10 feet above the ground. Archery hunters walking to a stand must wear blaze orange headgear. 4. Waterfowl hunters must wear blaze orange while walking to and from their hunting areas, but do not have to wear blaze orange while sitting in a blind or in a boat. 5. Turkey and predator hunters must wear blaze orange headgear while walking to and from their hunting areas, but do not have to wear blaze orange while sitting in the woods if 144 square inches of blaze orange is placed in a tree within sight of their hunting location. Predator hunters with a Nighttime Recreation Pass at night (after one-half hour after sunset and before one-half hour before sunrise) do not have to wear blaze orange. 6. Anglers actively engaged in fishing from a boat, road, at a designated angling site or on ice do not have to wear blaze orange. Anglers walking to and from their fishing areas or fishing along streams must wear blaze orange headgear. 7. Beginning in 2018, NYS law requires big game hunters age 14 and 15, and their mentors, to wear fluorescent orange or pink visible from all directions. The exposed shirt, jacket, or vest must have at least 250 square inches of solid or pattenred fluorescent orage or pink (the pattern must be at least 50% orange or pink) OR a hat with at least 50% fluorescent orange or pink. On Fort Drum, the explosed shirt, jacket or vest AND hat must be worn and can either blaze orange of pink. Most weapons including crossbows and compound bows transported in a vehicle must be unloaded and cased. An unloaded weapon is a firearm without ammunition in the chamber and/or magazine, if the magazine is in the firearm. A muzzleloader is considered unloaded if the percussion cap or primer is removed from the firearm or the primer pan is empty. A crossbow is considered unloaded if it is uncocked and the bolt is removed. A cased weapon is a weapon inside a case expressly made to contain and fully enclose that weapon in such a manner that no portion of the weapon is exposed when the case is zipped, snapped, buckled, tied, or otherwise fastened. If parked on a public highway but hunting on Fort Drum, this regulation still applies. Exceptions include: (1) pistols and revolvers in accordance with paragraph 7(f) and (2) long and recurve bows that are uncased and unstrung while being transported. The possession of firearms is prohibited in Training Areas 4A, 4B, 4D, 5A, 5D, and 6B during the big game season--these areas are open for archery and crossbow hunting only during the deer and bear season. Outside the big game hunting season, small game hunters may use shotguns or archery, and trappers are allowed to use .22 rimfire weapons to dispatch trapped animals. Fishing and other recreational activities are also permitted in these areas. Recreationists using these areas must follow normal check-in/check-out procedures. Training Area 6A is open to all recreationists, but no rifles may be used. All other weapons including muzzleloaders and shotguns with slugs are allowed for hunting. All weapons including bows and crossbows (except pistols and revolvers in accordance with Fort Drum Regulation 420-3 Paragraph 7(f)) transported in the passenger compartment of a vehicle must be unloaded and cased, or unloaded and in the closed trunk of a motor vehicle. If parked on a public highway but hunting on Fort Drum, this regulation still applies. * An unloaded firearm is a firearm without ammunition in the chamber and/or magazine, if the magazine is in the firearm. * A muzzleloader is considered unloaded if the percussion cap is removed from the firearm. * A crossbow is considered unloaded if it is uncocked and the bolt is removed. * A cased weapon is a weapon inside a case expressly made to contain and fully enclose that weapon in such a manner that no portion of the weapon is exposed when the case is zipped, snapped, buckled, tied, or otherwise fastened, with no portion of the firearm exposed. Hunting with a handgun is allowed. Bearing an exposed sidearm is permitted only when the person is in possession of a New York State pistol permit, and in accordance with Fort Drum Regulation 190-6. While engaged in trapping activities, only a .22 caliber rimfire handgun or rifle may be used or lawfully possessed. Only portable tree stands may be used on Fort Drum, but damage to trees must be minimized which includes no cutting of vegetation for shooting lanes. Portable tree stands may be left overnight, but the stands must be permanently marked with the name and phone number of the owner in such a way to be visible and legible from the ground. 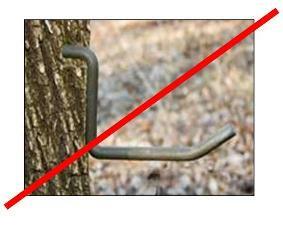 Placing a tree stand in an area does not guarantee or reserve that site for the hunter. Fort Drum is not responsible for any lost, stolen or damaged stands. Portable tree stands must be removed after the hunting season. Any stands left between January 1 - April 15 and June 1 - August 31 will be considered abandoned property and removed. Portable tree stands used outside this period will be considered on a case-by-case basis by contacting Fort Drum's Fish & Wildlife Management Program at 315-772-9636. The use of screw-in tree pegs is prohibited. Hunting from range towers or other range structures is also prohibited. Hunting for predators/furbearers is permitted at night beginning the day after the late muzzleloading deer season ends. Hunters engaged in nighttime hunting activities must have a valid nighttime predator access pass and follow check-in/check-out procedures. Upon reaching their destination in the Training Area, hunters must contact Range Branch (315-772-7152) and confirm their location. No running of dogs is allowed for night hunting. Dogs may be used to hunt all small game except wild turkey during the spring season. Dogs may be trained on small game on Fort Drum from August 15 - April 15, except for training on raccoon, fox, coyote and bobcat which is allowed from July 1 - April 15. The use of dogs on Fort Drum is the sole responsibility of the owner/handler; Fort Drum is not responsible for any injuries sustained by the dog while on Fort Drum. No feeding or baiting of wildlife for the purpose of hunting is allowed. Hunters must make every effort to trail and recover wounded deer/bear. Hunters may not, however, violate the 2 hour sunset restriction because of wounded game. Hunters should mark the spot they last saw sign and request assistance from the Range Branch (315-772-7152) and/or the Military Police (315-772-5156 or 772-5157). The tracking of wounded game into closed hunting areas requires the hunter to contact Range Branch and/or the Military Police. If wounded game goes off of Fort Drum, it is your responsibility to obtain permission from the private landowner. Follow New York State regulations for tagging and reporting harvested game. You are required by law to report your take via the toll free DECALS game reporting system within 48 hours, by calling 1-866-GAME-RPT (1-866-426-3778). Only bow/crossbow hunters harvesting deer and bear within the Cantonment Area are required to bring their harvest to the Check Station at Bldg. T-4848. The white-tailed deer is a highly valued big game species throughout New York State and, like most of the state, the deer population on Fort Drum is controlled by regulated recreational hunting. The overall goal on Fort Drum is to manage deer populations liberally to reduce conflicts with training or forest management activities (e.g., ensuring seedling regeneration) in the Training Area, yet provide quality recreational opportunities. In order to have a healthy deer population and keep numbers in concert with the habitat and human environment, ensuring a liberal harvest of antlerless deer (with a focus on females) is essential. A specific harvest goal in the Training Area is to achieve a harvest ratio of approximately 1 female:1 male through the use of Deer Management Permits (DMPs) which allows the harvest of antlerless deer. DMPs have been available on Fort Drum since 2002. Hunters can apply for and receive Deer Management Permits at all License Issuing Agents via the New York State Department of Environmental Conservation Licensing System (DECALS). When completing the NYSDEC license application, hunters may apply for up to two DMPs in the Wildlife Management Units of their choice. Those wishing to hunt on Fort Drum should specify Wildlife Management Unit 6H. DMPs are issued by random computer selection at the License Issuing Agent and if selected, applicants will receive DMP(s) immediately. Hunters possessing a DMP may take one antlerless deer per permit, in addition to a deer that may be taken with a regular big game license. Antlered deer with at least one legal antler 3" or longer may not be taken with a DMP. Deer populations on Fort Drum have remained relatively stable with harvest numbers slightly increasing after DMPs were made available in 2002. The antlerless harvest is analyzed each year and management decisions are made cooperatively between the NYSDEC and Fort Drum’s Fish & Wildlife Management Program. Harvest information for deer and bear harvested in Wildlife Management Unit 6H (Fort Drum) based NYSDEC calculations are available. See the Fish & Wildlife Management section of this web site for more information on management of various species on Fort Drum. See the following page for disabled access opportunities. NYSDEC Region 6 administers 22 Wildlife Management Areas (WMAs) encompassing 43,744 acres in 5 counties. Many of our WMA's include exceptional freshwater wetlands designated as Significant Habitats and/or Important Bird Areas. The NYSDEC also manages more than 775,000 acres of State Forests throughout New York State which are open to multiple activities including hunting. Other public lands can be found on the NYSDEC web site. There are several opportunities for special hunting opportunities for youth hunters in New York State. See the Youth Outdoor Opportunities page for more information.